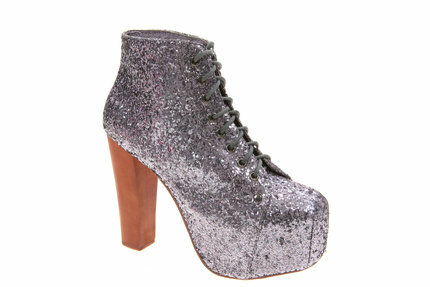 I saw an interesting piece in the papers yesterday about Jeffrey Campbells’ ‘Lita’ boots. JC supplies Barefoot Tess with a few selected shoes (including Lita) in larger sizes especially for their site. The Lita boot is not my cup of tea, but they are clearly popular as they have now been produced in 164 colours, selling over 160,000 pairs. Most people like them because they have a built in platform, which boosts height without sacrificing comfort, but as a tall women, I don’t find platforms particularly appealing. The ‘Lita’ have divided opinion throughout the fashion world, with some fashion insiders citing them as being as ugly as UGGs (ugly indeed) whilst fashion bloggers worth their salt are constantly being photographed in them and indeed blogging about them. Jeffery Campbell can do no wrong in my eyes, providing, as he does, some style choice for ladies with larger feet, but I do wonder about the Lita boots. The interesting thing about them is that because they are available in larger sizes, they must be one of the few shoes which are non-divisive, in other words, enable women’s style to be determined by their choice, not their size. Unfortunately, other shoes which hold this badge are UGGS, Crocs and Birkenstocks. Not exactly style icons, in my eyes. The question of whether tall women should wear platforms is of course a personal one. Luckily for me, I married a guy who is 6”7 so adding to my 5”11 height is not a problem, should I choose too. Truthfully, I wonder at tall women who wear big heels but I look at them with envy – are they prouder of their height than me? Should I want to flaunt it more? Either way, I don’t like the look of the ‘Lita’ boots which is in no small part due to their platform. Whilst on the subject of designers producing shoes for larger feet, Steve Madden is another Stateside designer who makes some of his more popular designs in larger sizes, specially for Barefoot Tess. Both Steve Madden and Jeffrey Campbell are big names in the States, in a way that individual British high street designers have yet to become. I’m hoping that is going to change, especially with retailers such as Upper Street Shoe, where you can design your own heels and who run a 9&10 club, celebrating us ladies with larger feet. To be able to design my own pair of heels, in my size, does feel like a total dream. And it will be, until I can afford the rather hefty price tag which goes hand in hand with custom made shoes. Until that day, I’m sticking to my trusty Camdens, which I wore out dancing on Saturday night with my new trousers from Baujken – the zip on the jeans and studs on the shoes felt suitably rock and roll. Camden has a 3” cone heel, which for me, is heel a plenty. Power to any tall women wearing more than that!